It seems to me that first-time parents are a little obsessed with doing things right. I should know because my husband and I are about to become first timers and they try to market a lot books, theories and other junk that we don't need to us. Some of it I enjoy for its novelty; others, make me want to throw up in my mouth a little bit. If there is one thing that I have learned so far in the four (almost five) months of being pregnant it's that you can't really prepare for whatever happens once your child is here. Parenthood, in this respect, represents the biggest leap of faith I have ever taken in my life. I'm doing the trust fall, and I hope I'm there to catch me on the other side. Now, I could get wrapped up in what will my child eat, where will more money, time, and more of "me" in general come from, but instead I have decided to focus solely on what I can control, which is basically getting the nursery ready. I am not really planning on a birth plan (though my doula will tell me from time to time that I veering dangerously into birth plan territory) and I am not making much of parenting plan, either. My big plan for parenting? My husband and I are going to be ourselves. You know what that means? 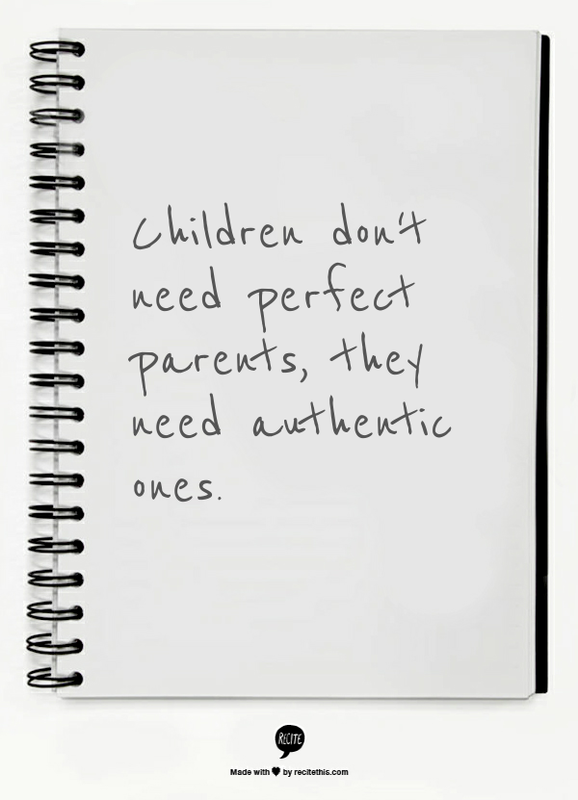 We don't plan on being perfect parents. It's a trap, anyway, in case you haven't surmised that on your own. Any mother I have ever spoken to has their own horror stories about the things they did that make them less than perfect parents. The funny thing is, most of them know that they occasionally screw up, make bad decisions or just plain don't care (exhaustion has a funny way of doing that, they tell me.) It's just that we are all running around trying so hard to "be the best" that we are too stubborn to admit we don't actually want to be perfect--we just want to be ourselves. In the final analysis, I blame society for putting these ridiculous guilt trips on parents about what we should or shouldn't be doing and when. For whatever reason, American mothers seem to hold in more guilt than Catholics, and I just wanted to say: I'm not playing the guilt game. I'm gonna screw up as a parent, but I'm not going to punish myself over and over again or (worse) tell myself that any of these things make me a bad parent. I am going to be a parent who is present and attentive. I'm going to be funny, down to earth, and not riddled with guilt for the times when I am not living up to the standard of the day. So whether you are an expectant mom, like me, or already a mom, I suggest you give yourself a break and not try and be perfect. And I don't just mean right this second--I mean all the time. Perfect is dull. Authenticity dictates that we have to be vulnerable enough to screw up, and you know what? 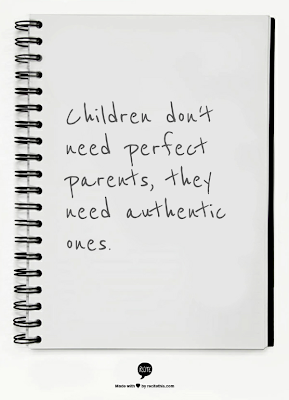 Most of the time, it's a great learning lesson for children to see their parents be normal humans. I know that my parents have made mistakes and seeing them deal with it has helped me in my life up to now. Be human. Be vulnerable. Do not attempt perfection--you'll be disappointed every time. Totally, 100% agree with this! I'm somewhat of a control freak (not to mention an Italian-American Catholic :) and I have fallen prey to the "perfect mom, perfect wife, perfect home" routine more times than I care to admit. I always fall short, I always end up frustrated with myself, and I have to take a deep breath and start from the beginning. Oh, and if you're looking for someone who has said multiple inappropriate things in front of their children, well, look no further than this comment. A few months ago I was stuck in traffic, and the person in front of me was in no hurry to get going. I was getting irritated, and my 2-year old son pipes up from the backseat, "dude, grow a pair and move it!" Yeeeeeaaaahhh. First shock, then trying to explain to said 2-year old that it's not appropriate to use language like that (while trying to not to burst out in hysterical laughter), all the while he's giving me this skeptical look like, "ummm, nice try Mom, but I'm pretty sure I heard you say the exact same thing last week." Anyway! Merry Christmas and congratulations on your pregnancy! Marisa, your comment made me smile so big!!! I definitely used to be in the perfectionist club when it came to being a wife, a housekeeper, an employee--you name it! I like to say I am a "perfectionist in recovery." LOL You are SO right about the falling short and being disappointed part...it's just so stressful! I give up and along with it, the guilt can take a hike too! Glad to see you are on my recovering bandwagon! We'll still trip up on perfectionism sometimes, but the getting back on wagon is easier! The biggest thing has chilled me out, surprisingly, has been my pregnancy! That came as a shock to me, but it has made me much more "roll with the punches" than I ever was before....hmmm, now if only that could work for me dropping the f-bomb so much! Haha.